Besides causing unnecessary deaths, widespread bloodshed, misery and hatred, wars are expensive and loss-making. World leaders would be best served to promote the agenda of peace that inevitably brings stability and profits. The leaders of the world’s 20 largest economies will converge in the beautiful city of St Petersburg for an annual summit that for obvious reasons has more to do with economics than politics. It would be difficult though for the heads of government to ignore the elephant in the room: The Syrian crisis. Just two days ahead of the summit, Russia’s Defence Ministry said its early warning radars detected the launch of two ballistic rockets in the eastern Mediterranean. After wild speculation that even caused Brent crude prices to go up, an Israeli Defence Ministry representative told RIA Novosti that the missiles, which fell into the sea, were launched by the Israeli military as part of a joint US-Israeli test of its missile defence system. Calls for war and air strikes have come from Washington and its western allies. It’s a tad ironic that one winner of a Nobel Peace Prize (Barack Obama) is calling for violence and is supported by a co-winner of the same prize (France as a member and raison-d’être of the European Union). One has to wonder as to why the White House hasn’t learned any lessons from its misadventures in places like Afghanistan, Iraq and Libya. A paper published by Linda Bilmes, a public policy lecturer at Harvard argues that the campaigns in Iraq and Afghanistan will cost US taxpayers $4-6 trillion after taking into account various costs including medical care of wounded servicemen. That is a greater sum of money than the entire GDP of 17 of the G20 members. If that figure is $6 trillion then, we can leave Japan out and make it 18 countries. Couldn’t this money have been spent on more constructive pursuits? 6 trillion dollars is indeed not pocket change for the global economy that seems to be faltering. What did the war in Iraq really achieve for the US? An American diplomat recently told this writer that he was frustrated about the fact that several major Iraqi oil contracts went to Chinese and French companies (both countries were against the intervention in the country). Afghanistan looks all set for a Taliban takeover when the international security force leaves the country, creating a situation similar to that before 9/11 when all sorts of terrorists were given safe haven. These wars also contributed to growing anti-American and anti-western sentiment throughout the Islamic world. Essentially 6 trillion dollars were poured down the drain without any kind of long-term benefit for the US. Throughout the Syrian crisis, Russia has maintained that war is no solution and that the parties to the conflict have to reach a political solution. Any voice of reason would agree that only a United Nations enquiry into the use of chemical weapons in Syria could be considered impartial. The hurry with which Washington has decided that the Assad regime carried out the attacks is puzzling. Wasn’t the same kind of intelligence reports that convinced the United States that Iraq possessed weapons of mass destruction? A western intervention in Syria could not just prove to be catastrophic to the greater Middle East as a whole, but the impact on oil prices would hurt emerging and developed economies alike. Countries like India, with a widening current account deficit and Japan, whose economy has been getting battered for as long as one can remember, would bear the brunt of greater instability in the Persian Gulf. China, the world’s second largest economy, is also facing a slowdown and being a net importer of energy, wouldn’t want crude prices going ballistic either. Brent reached a 6-month high of $117.34 last week; something that won’t have too many decision-makers in Beijing smiling. War would also create a problem in the shipping lanes and a headache for Chinese exports. Syrian crisis: Are there shades of international legitimacy? 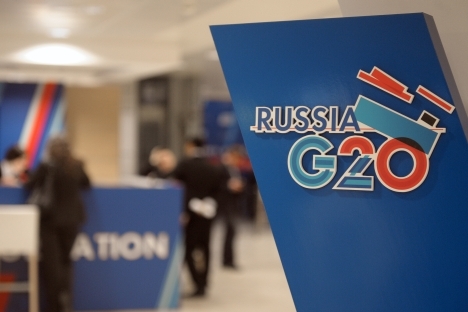 Reports from Washington indicate that the Syrian crisis would only come up for discussion at the G20 summit if Russia raises the issue. It would be a complete farce if world leaders don’t discuss what is easily the most pressing political and by default economic issue of the day. Russia needs to push Syria high up on the agenda. Most of the G20 members, who stand to lose a lot with another war, also have to push the real global powers to find a way to pursue peace. These members include countries like India, an aspirant to permanent membership of the United Nations Security Council that sits on the fence on any major international issue. It’s essential that the G20 members work on a global peace blueprint that will herald in a new era of economic development and prosperity. The existing conditions of global insecurity and instability hardly create an environment conducive to economic recovery. Tailpiece: This morning, the Dalai Lama said in a tweet that he was “convinced that that there is a growing appetite for peace in the world. Many young people are fed up with war and violence.” Wouldn’t it be nice if governments were equally fed up?